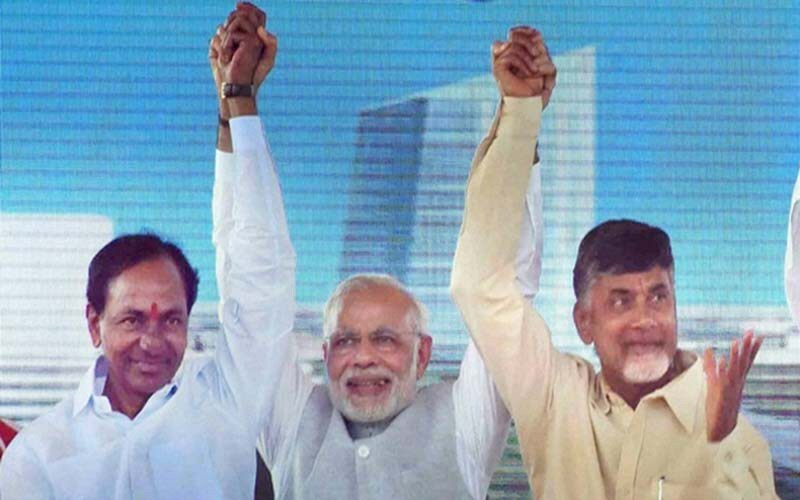 Andhra Pradesh Chief Minister N. Chandrababu Naidu on Thursday alleged that TRS chief K. Chandrasekhar Rao, actor-politician Pawan Kalyan and YSR Congress leader Jaganmohan Reddy have colluded with the BJP to target him. With Telangana’s acting Chief Minister and Telangana Rashtra Samithi (TRS) chief Chandrasekhar Rao continuing his bitter attack on Naidu, calling him a “thief and betrayer”, the Telugu Desam Party (TDP) president accused Rao of colluding with the Bharatiya Janata Party (BJP). Naidu was talking to reporters on the sidelines of inauguration of a facility by Xiaomi and Dixon Technologies to manufacture Mi LED TVs in this temple town. The TDP chief, however, said he would not respond to personal attacks by KCR. “I speak on ideologies and policies. I never resort to personal attacks,” he said when asked to react to KCR’s bitter attacks on him during election meetings in Telangana. With KCR also targeting Naidu for TDP’s alliance with the Congress in Telangana, Naidu said the party took the step due to political compulsions. The TDP president, however, ruled out similar arrangement with the Congress in Andhra Pradesh, saying the latter does not have much presence in the state. Indirectly defending the alliance with the Congress in Telangana, Naidu recalled that the United Front, of which he was the Convener, had taken the Congress party’s outside support to form the government at the Centre. Claiming that he developed Hyderabad as the information technology hub when he was the Chief Minister of undivided Andhra Pradesh, Naidu said he did it for Telugu people. He pointed out even KCR and his family members admitted that the credit of developing Hyderabad goes to him. Naidu alleged that Prime Minister Narendra Modi had hatched a conspiracy to target him and the TDP. He said Modi was using central agencies against him. Stating that he was not afraid of anybody, Naidu said he had clean record and credibility in his 40-year-long political career. The TDP leader said Modi was trying to tarnish established political leaders and demolish established institutions. He condemned what he called attempts by the Centre to take over the affairs of Tirupati temple. Naidu predicted that an alternative will emerge to the BJP-led government at the Centre. Such an alternative was necessary to undo the injustice done to people of the country, especially the people of Andhra Pradesh, by the Modi government, he said. Naidu, whose TDP pulled out of the BJP-led National Democratic Alliance (NDA) in March this year, said BJP had done more injustice to Andhra Pradesh than the Congress which bifurcated the state. “You have not given the special status which you had promised in 2014,” he said and accused Modi of also going back on the promise to implement Andhra Pradesh Bifurcation Act. The TDP chief also slammed the Modi government over “Rafale scam”, saying Bofors was small compared to this. He alleged that people have lost faith in the banking system as those who committed bank frauds fled the country. He also targeted the Centre for rising fuel prices, devaluation of rupees, its failure to achieve anything from demonetisation and improper implementation of the Goods and Services Tax.